Blurb: Raven is on a suicide mission. Jex is a biomech on a mission to save humanity. They discover their mutual passion to destroy the enemy isn’t their only desire. About the author: L.J. 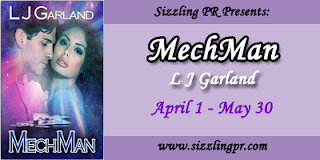 Garland is a husband-wife writing team who has thrived within their own romance for over 20 years. One of their favorite things to do is get into a hot bubble bath and brainstorm story ideas. Amid their long list of hobbies and interests, two activities stand above the rest. They are both licensed helicopter pilots with hundreds of hours of flight time, and they practice with a variety of weaponry from long bows to high-powered combat rifles. This, along with years of military experience, gives their books a heightened sense of reality. They enjoy their life together in a house filled with love, laughter, and adventure along with their three cats, whistling guinea pig, and three boisterous sons—who conspire to ensure there’s never a dull moment. They love hearing from readers who’ve enjoyed their stories at mail@lj-garland.com.